33116 (D6535) Hertfordshire Railtours passes through 1930s Art Deco Tolworth station en-route to Chessington South with the D-Tours 'Tatty Cat' railtour on 4 March 1995. 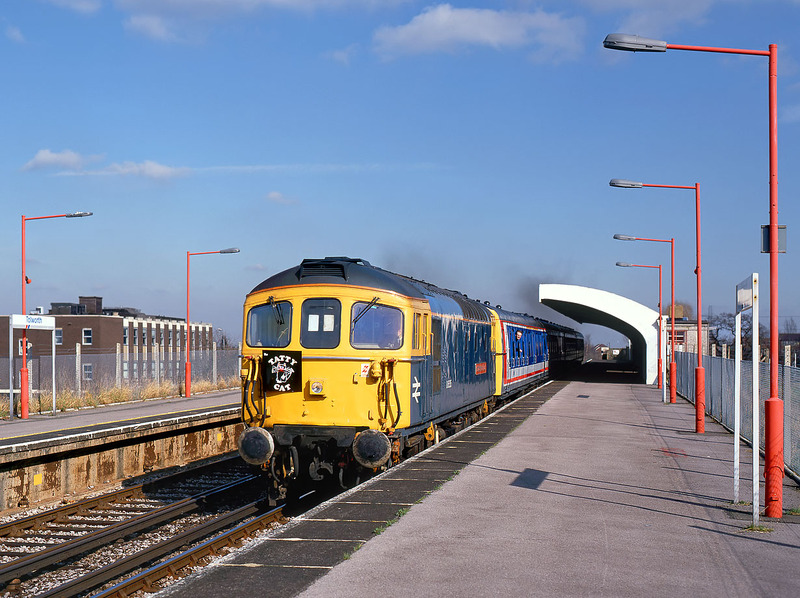 Utilising 4-VEP EMU 3581 as coaching stock, the tour started from Clapham Junction at 10:00, and travelled via Twickenham and Raynes Park to Waterloo. It then retraced its steps to Raynes Park, headed down the Chessington Branch, before proceeding to Wimbledon, Guildford, Norwood Junction, Tattenham Court, Purley, Caterham, London Bridge, and finally Victoria.